I’ve decided to revive my ‘quotes’ file that I used to keep. I couldn’t resist posting the first entry into it, because it represents so much of why I love reading and also justifies my dislike of driving. One of the great things about Heinlein (and other authors) is that some of the best passages are really just them doing some exposition on some topic that they are passionate about. The passages tend to be only tangentially related to the plot at hand, but are nonetheless part of what makes the work great. By the way, the majority of quotes are much, much smaller, but there was no real way to shorten this particular one. “A reciprocating engine was a collection of miniature heat engines using (in a basically inefficient cycle) a small percentage of an exothermic chemical reaction, a reaction which was started and stopped every split second. Much of the heat was intentionally thrown away into a ‘water jacket’ or ‘cooling system’ then wasted into the atmosphere through a heat exchanger. What little was left caused blocks of metal to thump foolishly back-and-forth (hence the name ‘reciprocating’) and thence through a linkage to cause a shaft and flywheel to spin around. The flywheel (believe it if you can) had no gyroscopic function; it was used to store kinetic energy in a futile attempt to cover up the sins of reciprocation. The shaft at long last caused wheels to turn and thereby propelled this pile of junk over the countryside. The prime mover was used; control, only to accelerate and to overcome ‘friction’ — a concept then in much wider engineering use. To decelerate, stop, or turn the heroic human operator used his own muscle power, multiplied precariously through a series of levers. Despite the name ‘automobile’ these vehicles had no automatic circuits; control, such as it was, was exercised second by second for hours on end by a human being peering out through a small pane of dirty silica glass, and judging unassisted and disastrously his own motion and those of other objects. In ed in his almost all cases the operator had no notion of the kinetic energy stored in his missile and could not have written the basic equation. Newton’s Laws of Motion were to him mysteries as profound as the meaning of the universe. Nevertheless millions of these mechanical jokes swarmed over our home planet, dodging each other by inches or failing to dodge. None of them ever worked right; by their nature they could not work right; and they were constantly getting out of order. Their operators were usually mightily pleased when they worked at all. When they did not, which was every few hundred miles (hundred, not hundred thousand), they hired a member of a social class of arcane specialists to make inadequate and always expensive temporary repairs. That’s from Robert Heinlein’s Space Family Stone (originally 1952, but this is from a 1971 paperback edition that I paid about $0.40 for, but it’s on Amazon for $29) . It’s one of his “space opera” style deals that, as far as I can tell, has no real purpose other than to tell a story about a family and some experiences of theirs. A quick summer read. The whole section puts things in perspective, and especially justifies why somebody like me (who tends to be absent-minded while driving) really does not belong behind the wheel of one of these “mechanical jokes”. Did anybody predict computers accurately? I’m reading a series of short stories by Isaac Asimov (Earth is Room Enough) written in 50s and one of the things that struck me is how badly the state of computing technology was predicted. It’s not just this book, it’s virtually any that I can think of from the 40s and 50s. They mostly assume that video phones will be completely normal, and of course “internal combustion ground cars” will be long gone by early in the 21st century. Going to Mars? Sure, $20.50 please, Customs is over there. Naturally we’re on biometric identification (how would we not be!). Computers are infinitely smart and are the size of an office building (woops!) and communicate with what is basically fancy punch cards (woops again). They’re made out of foil so they are futuristic. Video calling is slowly becoming popular (it’s been possible since the invention of television basically). No doubt we will be off internal combustion within the next 100 years or so, but I doubt we’ll be flying by then. Biometric security is actually becoming fairly mainstream. Regular trips to Mars (or even the Moon) are probably at least 50 to 100 years off as well. But you can fit a computer that is multiple orders of magnitude more powerful than a computer from the 50s onto a credit card. If a computer is the size of an office building, it’s really thousands and thousands of individual machines clustered together doing some ridiculously complex (but specialized!) calculation. Computers are nowhere near being infinitely intelligent generic thinking beings. And we’re certainly not communicating via punch-card (though Assembler isn’t too far above, but it’s still entered directly into the computer). Not that today’s programming languages allow us to simply “say” what we want, they are at least unambiguous (you don’t actually want normal human language to be used to tell a system what to do, it’s so chock full of idiom and ambiguity) for the most part. And computer displays are high resolution and capable of displaying interconnected graphics and text in a way that someone from the 40s and 50s couldn’t make a leap to. Does anybody have any examples of old (pre-60s) science fiction stories that have some inkling of where computers would be today? I’d actually love to see other examples people have of how computers were perceived in various eras in both science and science fiction. Or maybe collection already exists and someone can point me there. My wife and I try to read fairly steadily. But I was just thinking that the cost to send these books back are probably going to be quite a bit more than I paid for most of them (there’s a local market that I pick up a lot of used books for on average 1 GBP ($2). The ones of the left are what we’ve read since getting here and the rest are “to read”. 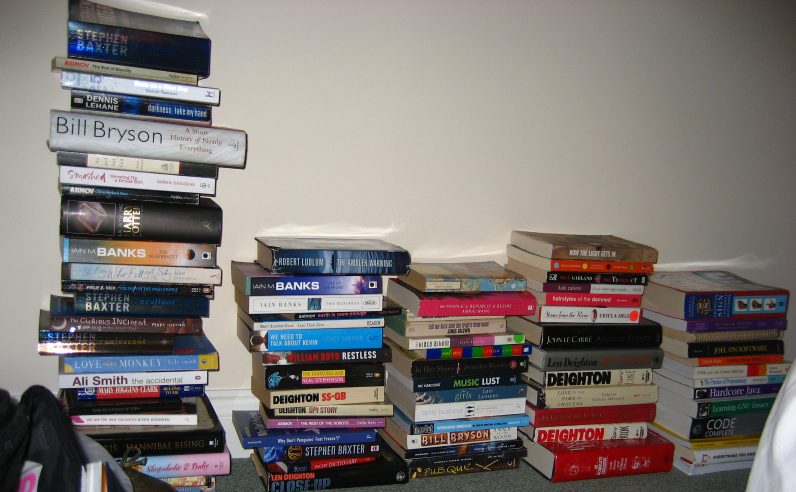 The rightmost ones actually were ones we sent *from* the US for reference and to read. I’ve been getting into Stephen Baxter, but I kept ignoring him in the states because I only saw him attached to some Arthur C. Clarke books and I tend to not read books that are co-written like that. Incidentally, Arthur C. Clarke has traditionally been my “favorite” author (I’ve got most of what he’s written fiction-wise, about 45 books or so) but haven’t actually read him in years as he’s been mostly doing the “co-written” stuff. What this means as the ACC came up with a story, and Baxter wrote it. But they are never pitched that way, ACC is in the big letters as if it’s all him. I dunno, just seems slightly misleading. But I digress. Baxter turns out to write some cool “big idea” books, I’d recommend the Destiny’s Children (yeah, I know. Close, right?) series (Coalescent and Exultant are the ones I’ve read so far) in addition to Evolution (which I just read… very cool hypothetical evolutionary history starting with the earliest primates during the time of the dinosaurs). Bill Bryson is absolutely hilarious and insightful in whatever he writes. I managed to get Short History of Nearly Everything for 2.50 ($5) at the local market. Very good read and actually goes well with Evolution a bit. As you can tell, I try to have a fairly eclectic mix of books; I try not to read only SciFi or technical but also “literature”, mystery, thriller, history, etc. The list mostly makes sense… except that #2 is “Harry Potter: The Goblet of Fire”. This is sad given that these are books directed at children and adolescents, who can easily breeze through the entire thing. “Ulysses” by James Joyce is #3. More people can finish “Ulysses” (percentage-wise) than a Harry Potter book!? Granted, the sample size is quite different.